What do we want to see in an Alabama Water Plan? SELC and ARA advocate for continued funding for water assessments to help inform the development an Alabama Water Plan. The Legislature’s decision to invest in water assessments has been remarkably valuable, benefiting Alabama’s economy, culture and quality of life. To fully anticipate water availability and demand in the future, it is necessary to determine the needs of Alabamians, as well as the needs of our river systems. Continuing to gather data for assessments will improve the state’s ability to manage water during drought, ensure quality drinking water, provide reliable resources for crop irrigation, and protect water conditions for future generations. Without having the complete picture when assessing our waters, we cannot determine our shortcomings or how to address them. The legislature should continue to fund these water assessments to build upon the great work already done to measure and protect the health of Alabama’s rivers, lakes and streams. Assessments will measure how much water is in the state and our capacity to meet future uses. Ecological-based assessments will gauge water conditions to preserve aquatic wildlife and recreation for the countless citizens who enjoy fishing, hunting and boating all over the state. Measuring the flow of water across the state can better prepare for water shortages and droughts, avoiding millions of dollars of additional funding to purchase drinking water during a crisis. Several important industries depend on water to grow crops, power homes and facilitate recreation. 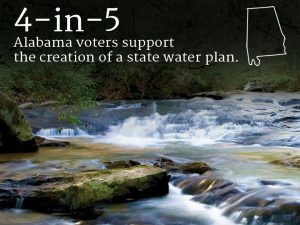 A comprehensive analysis of water use would give them more reliable information to invest in Alabama’s economy. Knowing Alabama’s exact conditions is especially important because of the uncertainty of water availability attributable to the interstate water wars with Georgia and Florida. By continuing to leverage the state’s expertise through assessments, we can keep rivers and streams healthy and protect the quality of life for our children and grandchildren. Monitoring and Management of Water Withdrawals – Enhance the current certificate program to ensure more accurate monitoring and management of water withdrawals on a statewide basis. Protection of Instream Flows –Put in place procedures for science to determine the amount of flows needed in our river systems and groundwater resources in order to sustain all of the demands for water withdrawals, while ensuring the natural system remains healthy and sustainable. Management of Interbasin Transfers – Manage the exchange of water from one basin to another to maintain and protect the health and flows of each natural system involved in the transfer. Conservation and Efficiency Programs – Implement statewide programs incentivizing and requiring money-saving and water-saving conservation and efficiency programs.